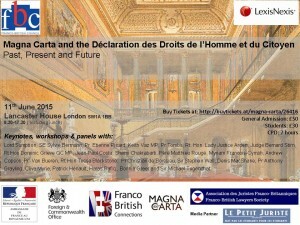 Full title: Franco-British Conference on Europe and Human Rights:Magna Carta and the Déclaration des Droits de l’Homme et du Citoyen. Following the UK election result, the future of the UK in Europe and Human Rights issues are once more highly topical. 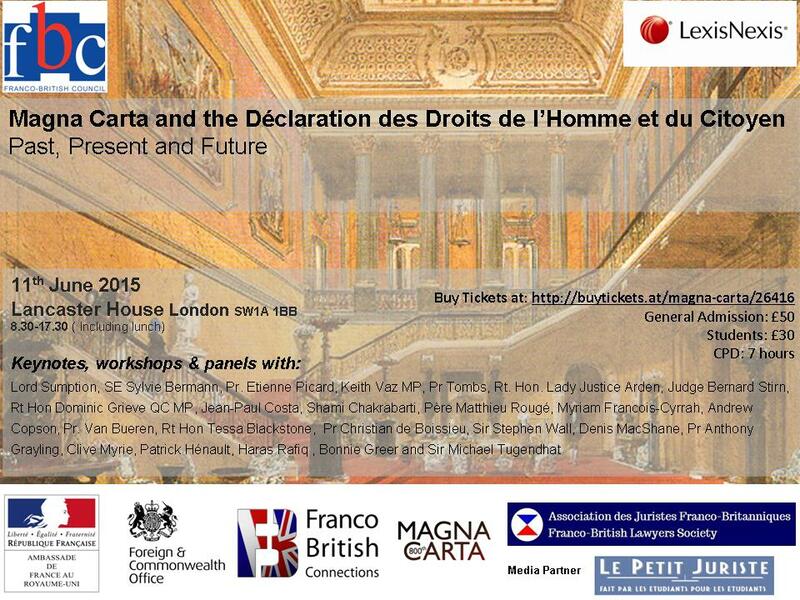 A one-day Franco-British conference will be held at the prestigious Lancaster House near Buckingham Palace to discuss these in the context of the continuing relevance of the Magna Carta and the Declarations des Droits de l’Homme et du Citoyen. Proceedings will be conducted in English. • How relevant are these documents today? • Should Europe have more or less power over its member states? • Do the domestic political classes need to regain legitimacy? • Do religions have a legitimate right to be exempt from special treatment? • Are the secular settlements of Europe secure? We welcome your contribution to this important debate so the day will include interactive discussion and small roundtables in the afternoon. Please find more information and the agenda of the seminar here. The event is being organised with the Franco-British Lawyers Society, Franco-British Connections and is being supported by LexisNexis, the French Embassy and the Foreign and Commonwealth Office, as well as Magna Carta 800th.